Myrtle Beach Golf & Yacht Club in Myrtle Beach, South Carolina is an active lifestyle community featuring a variety of amenities in an enviable location. Made up of over 1,000 homes, Myrtle Beach Golf & Yacht Club offers homeowners low-maintenance single-family residences on a resale-only basis. To stay active, residents have full use of the community center that offers both indoor and outdoor amenities. Homeowners also have access to all that local Myrtle Beach has to offer, including everything from shopping and dining to outdoor recreation. Nestled among the homes in Myrtle Beach Golf & Yacht Club is the community center, a clubhouse including indoor recreational facilities as well as outdoor. Residents can gather socially in the multi-purpose room for one of the many clubs offered onsite, or travel outside to relax poolside. The pool area also offers two outdoor spas for resident use. Outside the clubhouse is a picnic area that can be used for everyday meals or large gatherings of friends and family. There's even a playground, and a park. Residents who want to stay active have no shortage of options, including two tennis courts for a game with neighbors, winding trails for walking and biking, and two shuffleboard courts. There's even a designated area for R.V. and boat parking, allowing for adventure outside the community throughout local Myrtle Beach as well. Built between 1985 and 2012, Myrtle Beach Golf & Yacht Club features 1,024 residences spread over the sought-after region of coastal South Carolina. Single-family homes are available to potential residents on a resale basis. With multiple builders, homebuyers have a variety of customized resale homes to meet all different tastes. Single-family homes in Myrtle Beach Golf & Yacht Club offer residents low-maintenance, single-level living. All single-family homes feature two to three bedrooms and one to two bathrooms. Models range from about 1,100 to 1,800 square feet of living space, and some offer attached garages. Many also offer back patios or Carolina rooms to allow residents to enjoy the sunny South Carolina weather. Residents of Myrtle Beach Golf & Yacht club enjoy an active lifestyle thanks to a number of amenities available. The homeowners' association fee covers general maintenance of community grounds and recreation facilities, as well as lawn care for individual homes. This low-maintenance homeownership gives residents time to enjoy all the community has available. A variety of clubs, classes, and activities take place in the community center. Residents can stay fit with aerobics, yoga, and Zumba classes, or exercise the mind with poker or Mah Jongg. Men's and women's golf clubs travel to local courses to practice their skills. There is an activity for every interest, from Bible study to senior singles, who host activities like pasta parties and community bake sales. Located in Coastal South Carolina, Myrtle Beach Golf & Yacht Club is conveniently located near a variety of dining, shopping, and entertainment options. A number of golf clubs are nearby, including Myrtlewood, Whispering Pines, and Waterway Hills. With campgrounds a short drive away, residents have no shortage of outdoor recreation available. Just seven miles from the beach and close to Highway 707, homeowners can enjoy all that Coastal South Carolina has to offer. The community is also near local grocery stores and shopping centers for convenience. 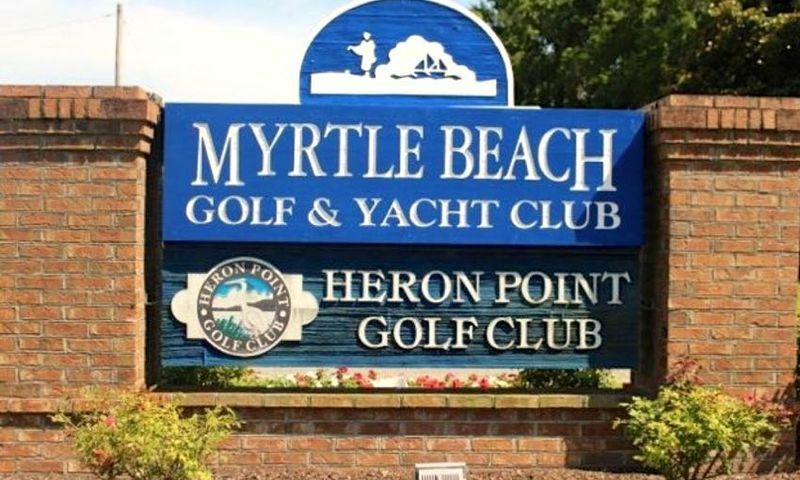 Myrtle Beach Golf & Yacht Club is a short drive from Grand Strand Medical Center, and only a dozen miles from the Myrtle Beach International airport, making travel a breeze. With so much to offer, Myrtle Beach Golf & Yacht Club is a very popular choice in the Myrtle Beach area. There are plenty of activities available in Myrtle Beach Golf & Yacht Club. Here is a sample of some of the clubs, activities and classes offered here. Single-family homes in the community offer low-maintenance living included with the homeowners' association fee. Homes are between two to three bedrooms and feature one to two bathrooms. Models offer 1,100 to 1,800 square feet of living space. Please Note: Floor plans are not available at this time. 55places.com is not affiliated with the developer(s) or homeowners association of Myrtle Beach Golf & Yacht Club. The information you submit is distributed to a 55places.com Partner Agent, who is a licensed real estate agent. The information regarding Myrtle Beach Golf & Yacht Club has not been verified or approved by the developer or homeowners association. Please verify all information prior to purchasing. 55places.com is not responsible for any errors regarding the information displayed on this website.